Ethan, like many children, was starting preschool for the first time this September. In the run up to him starting, I wanted to make sure he knew what was going to happen, that it was normal, fun and exciting. I wanted him to know it was normal to be worried and scared about going, but that it would be an enjoyable experience It was hard to get the balance right between informing him about what would be happening and going overboard and giving him more concerns! Harper Collins very kindly sent us some books to review in August. They couldn't have been on a better subject; starting school! Now, I know Ethan wasn't starting "proper" school, just preschool, but as he'd never spent time away from me in a "learning" environment (even if it's learning through play) before, I knew that books on this subject would be helpful. I honestly believe the two books we were sent helped ease his (and my!) concerns and made school something to look forward to! So, what were we sent? Well, we were sent a copy of "Come to School Too Blue Kangaroo!" 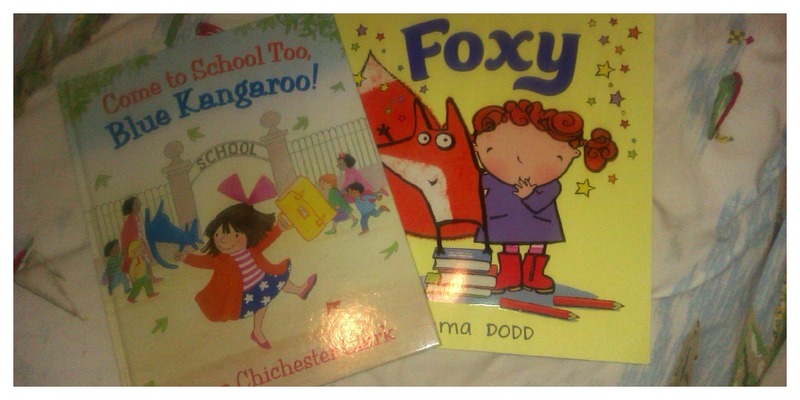 by Emma Chichester Clark and "Foxy" by Emma Dodd. Seems to me ladies called Emma are good at writing about starting school... sorry, lame! First up, Come to School Too Blue Kangaroo! This book was written by Emma Chichester Clark and is part of a series of books featuring Lily and her Blue Kangaroo. Ethan and I hadn't read any of these, but we have read the Melrose & Croc books she wrote. We borrowed all of them from the library and Ethan was smitten by them for a long time. Such sweet books. This book captured Ethan's attention straight away. When I read this to him, he goes quiet and doesn't fidget, a sure sign he's looking and listening. He loved the idea of a toy kangaroo who can think and gets up to all sorts of things. What a lovely way to capture a child's imagination, it's just what they like to believe (to be honest, I still like to believe that. Toy Story is real, right?!). The story is simple. Lily is due to start school and wants Blue Kangaroo to come with her. She believes Blue Kangaroo is worried about going, but in actuality, he can't wait! It's lovely, it's a subtle way at hinting that actually, Lily is the one who is worried, just like most children are at the thought of such a big change. For the reader, or the child being read to, it's wonderful because they can hear what Blue Kangaroo is thinking, which is of course that he is excited and looking forward to trying out all the new experiences school has to offer. I won't spoil the story, but suffice to say Lily and Blue Kangaroo get on fine and adjust very nicely to school life. Lovely. 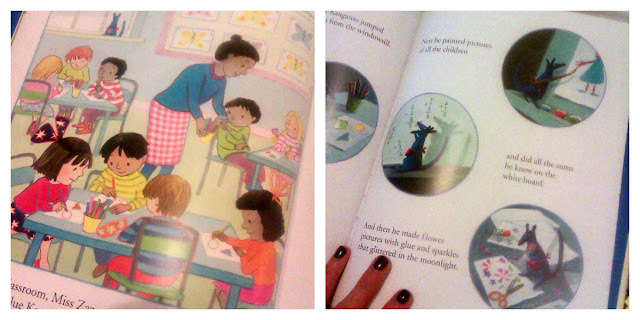 The illustrations are gorgeous. This book is enchanting and has me in a spell. 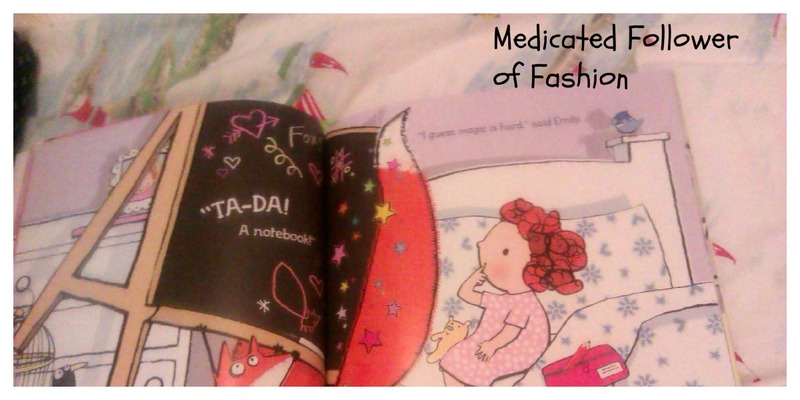 I often pick it out to read to Ethan at bedtime, it's just lovely. This book is a little more "out there" but the sentiment is the same. Though school is new and scary, it is normal and fun too. Emily is a little girl trying to sleep on the night before school starts. Foxy appears at her window and helps her to get everything she needs ready for school. This story isn't too wordy, so is quite good for the 3-4 age group, especially if you have one with a short attention span (Ethan likes longer books his favourites being The Lorax & The Cat in the Hat so we don't usually have that issue). It's a little bit wacky, but it's still a sweet story. I do find it a little confusing to read and often have to add things myself so I can be sure Ethan understands what is going on, but it's still a book we both enjoy and Ethan often chooses it. The illustrations are very bold, very current. Lots of eye catching bright colours. The message is reassuring. Emily is concerned that no one at her school will likely, but Foxy reassures her that she doesn't need magic to help her with that, everyone will like her. A sweet message! If I had to pick between the two, Blue Kangaroo would be my favourite, but they are both lovely books that we continue to read and I'm sure will become very useful next August in the run up to "big school". Books are a fantastic way of getting a message across to children. I had to employ their help when my son was afraid to go to the dentist, thankfully it worked. Both of these look lovely. They are!! I also used books to help with Ethan when he was potty training and scared to poo on the potty - there are loads of books all about pooing! !